I want to do a little summer dreaming and walk you through the new tomato varieties we are growing this year and invite you to join our Red Wagon Research Team! These tomatoes are all varieties that have been developed and selected by tomato plant breeder, Bradley Gates in Napa, California. 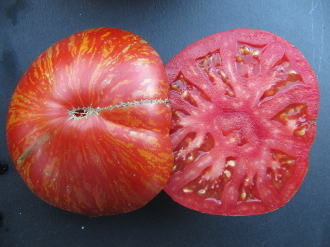 These are tomatoes that have been either selected over the years from existing open-pollinated heirloom varieties, or they are varieties that Bradley has hybridized over many generations. 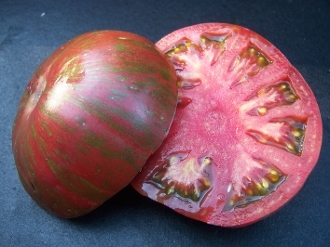 They are not technically heirlooms because they have not been around a long time, but they have the color and flavor of what people associate with heirloom varieties. Our thoughts are wandering to late August, when we grab that warm fruit, and bite in, dripping juices down our chin and arms. Maybe a little salt shaker will find its way into the garden tool box. Let us know if you want to help us track the results of these new varieties. We would love to get customer feedback about these exciting new tomatoes.